Recognizing that our efforts are primarily to ensure outdoor recreation opportunities for future generations, all of the events hosted by the East Texas Woods & Waters Foundation are family-oriented. As upcoming dates are confirmed, they will be posted here. In the meantime, take a look at a few of the events we sponsor or support and decide which ones would be best suited to your family. 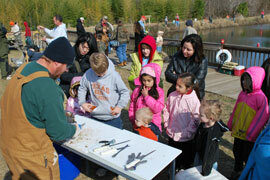 Trails to Trout Kids Fishing Event at the Tyler Nature Center. Many children that live in urban areas have never had the opportunity to bait a hook or land a fish. Texas Parks & Wildilfe biologists stock and manage the fishing pond at the Tyler Nature Center and then provide all fishing gear and training for you to experience fishing fun first-hand. Held on the first two Saturdays each January, this free event is always popular event for kids and their fishing mentors! Contact TPWD (903-566-1615) for more information.